A+ Fitness is a private one on one training studio in Oklahoma City that specializes in Weight Loss and Sports Specific Training. A+ Fitness teaches optimal fitness, nutrition, and metabolic conditioning with a focus on creating a better mind, body, and diet. Nitroforce Industries is taking fitness training, home exercise equipment and gym machines to the next level by increasing the body’s ability to produce speed, power, reaction time, agility, and movement coordination far beyond what existing equipment provides. The emphasis of the Titan® 1000 by Nitroforce is on muscular STIMULATION, instead of muscular ANNIHILATION…shifting the metabolism to increased anabolism and reductions in catabolism, “more gain, less pain”. Nitroforce means more RESULTS! Results require variety in pace, style and effort. And that’s what sets Body Renew Fitness apart! The Body Renew Fitness team of certified personal trainers provide customized exercise plans tailored to the individual body, fitness level, and personal goals. This means more efficient workouts – and quicker results! No matter your goal – weight loss, rehabilitation, sports performance or improving how you look and feel – Body Renew Fitness can help! See More NFPT Trainers doing amazing things! You could be a Personal Trainer Spotlight on our Award Winning Blog! “I’m a figure competitor and loved the training so much I decided to get certified to become a personal trainer. I expected the certification materials to be dull and outdated…as a figure competitor, I tirelessly research and use the most cutting-edge conditioning techniques I can find. When I applied to NFPT, I honestly expected the info to be useless compared to the tips and tricks I’ve picked up along the way. Instead, I was astounded to discover that NFPT’s approach is absolutely cutting-edge. I could not put the manual down. It was fascinating to finally understand on a cellular level the mechanics of how I’d been able to utterly transform my physique as I had in my sport. I feel very confident to now help others achieve amazing results via knowing the WHY in addition to the HOW. 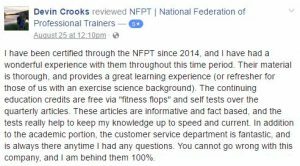 I am so grateful to you, NFPT!” -Lindon W.
“NFPT has been a great experience for me. After being an athlete all my life and teaching and coaching in the public schools for 34 years, I needed something to fill my time. NFPT has given to me the opportunity to continue working and helping people.” -Cyril H.
“So far this is the best certification I’ve acquired, very different, detailed and on point. As well as being very explanatory, I constantly refer trainers to your great program. 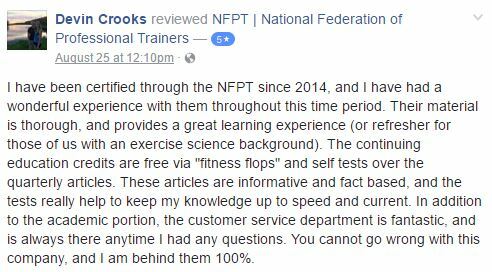 Thank you!” -Mike N.
“I recently purchased NFPT material to become a CPT and found it very informative, tweaking my brain & creating a thirst for knowledge that I thought I wouldn’t be able to satisfy. Thank you NFPT!” -Zach A. “I just wanted to tell you… I passed my exam!! YEE HA! What a great feeling! Thank you for all your support while I was working toward this goal. You really helped me feel like there was someone out there and that I wasn’t in this thing alone. I was so inspired by all of you…what a GREAT group of folks!” -Lisa R.
Certification package options to best suit your education and test prep needs.